Soon after the month of Ramadan, the Islamic month of fasting, the season of bands and marriages ushers in with its pomp and show. You go anywhere, and would find long motorcades of “barat (the grooms journey to the bride’s place for the wedding ceremony)” on every road. The groom’s car is beautifully decorated with fresh flowers, garlands, and buntings. Some even put on glittering lights as well. Like everyone else, I was also been invited on a number of weddings this month. Two I have already attended and a few a are yet to be attended. I went to Lahore on the weekend to attend the wedding of a friend’s daughter. Although, the a lot of ceremonies precede the actual wedding, like the dholki, mayoun, mehndi and nikkah ceremony, I could only make it to the wedding day due to the studies of my sons. All these ceremonies are very heavy in music. Mostly people hire local singers to their homes and even hotels to entertain the guests with wedding songs. Some even arrange military or local brass bands to be played on weddings. Although the trend of playing brass bands is on the decline in the cities, the tradition still goes on in small towns and villages, where musical groups are not that popular. In villages, the barat procession Is generally led by the local brass bands, dressed like military bands. 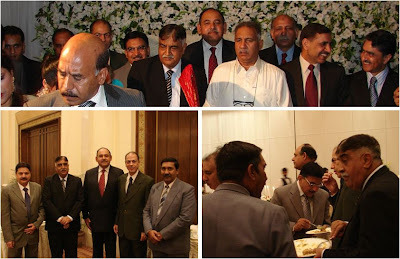 The wedding was arranged in one of the leading hotels of Lahore, which can accommodate almost half a dozen of such functions simultaneously. And obviously this calls for lot of rush, hundreds of cars to be accommodated in the limited parking lot of the hotel. It took me a while for my sons to locate a parking for our car. It took quite a while and when we entered the arena, the food had already been served and people were busy in their dinner. My friend was very pleased on our arrival and straightaway took me to the centre stage to introduce me to the groom and beside pleasantries, we had a photo session. I had a number of old friends attending the marriage, so we all got together in a corner, had food and a good gossip. Then it was time for wedding rituals. One of the rituals is that the sisters and cousins of the bride take off one of the shoe of the groom and ask for some handsome money in return. They ask a lot of money and a hearty debate goes on between from sisters and cousins from both sides amid large uproar and NOs when a smaller amount is presented. After a lot of “Hulla Gulla”, both parties finally settle for an agreed sum in return of the groom’s shoe. I wish Cinderella could see this ritual. This is the last ritual after which the bride walks out with the groom to her new home amid tears and wishes from everyone. For the second wedding, that of a son of a friend of mine, I had to rush back to Islamabad from Lahore and I barely made it to the venue. All wedding have a similar pattern in cities, while in villages, there are minor differences owing to local customs and traditions. I will write more about the various rituals some other day.